As Chinese communities celebrate the Year of the Rooster in 2017, Knight Frank hands down its latest residential research report highlighting the growing presence of Chinese developers in the Australian market. Chinese developers and investors purchased $2.4 billion worth of Australian residential development sites in 2016. This was 9.4% stronger than recorded in the prior year. This trend has been emerging over the past five years while the Australian residential market collectively strengthened throughout 2012 and in 2013, growth in sales turnover encouraged prices to rise for local developers and investors alike. At this time, the Australian dollar became very favourable against other currencies for investment into Australia. The Chinese renminbi was no exception. 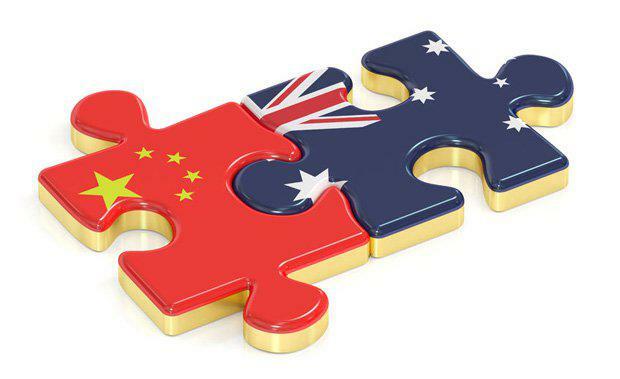 Opportunistic developers, many for the first time, considered Australia to build their next development after becoming a household name in homeland China. It was considered, and still is to some extent, worth the risk to build a first-time signature development (even if profitability resulted to be just breakeven) to be accepted as a reputable developer, by the local Australian market. Despite overall total sales falling during 2016, and sales to Chinese developers and investors are still 11.2% lower than the market peak recorded in 2014, their influence has grown. In the past three years, Chinese developers and investors accounted for over 25% of disclosed total sales each year with 2016 recording a share of sales as high as 38%. As Chinese developers gain confidence in the local market, diversify and move towards lower density developments, the sites transacted have increased significantly in average size—increasing more than 18 times since 2012, to average 21,045 sq m in 2016. The last significant expansion in size area was experienced in mid-2013 when multistaged sites suitable for high-density were strongly pursued. 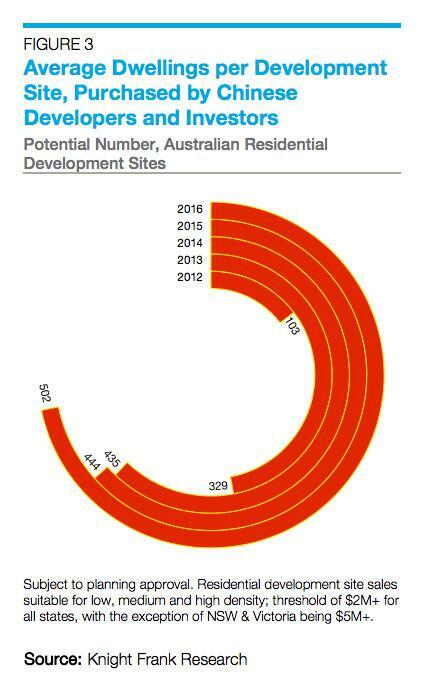 Analysing Australian development sites transacted by Chinese developers and investors in 2016 found the average development site purchased could yield 502 potential dwellings. This has jumped 13% from an average 444 potential dwellings from 2015 sales. Despite Chinese developers being visible in Australia pre-2012, for many this was only possible with a pre-established local connection before arriving in Australia. In 2012, the scale of the residential development was much smaller with the average site transacted having an area of just under 1,200 sq m with an average potential 103 dwellings yielded per site. 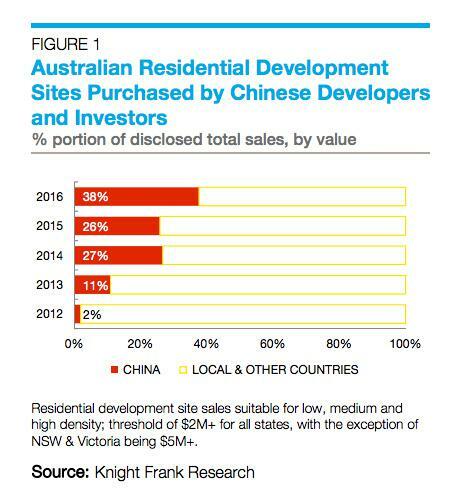 It was in 2013 the rise of the Chinese developer became most evident in Australia. Prior to this, some developers arrived to inspect their previously unseen site, sometimes having had minimal due diligence carried out; an essential element carried out by local developers to satisfy lending institutions requirements. For many, these brave investments paid off with the on-selling of sites once development applications were approved; off-the-back of an upward trajectory in values, before demolition even began. For some, purchasing an income-producing property was a wise move while liaising with local industry professionals to seek the highest-and-best-use for the site, and tackling the rising cost of construction across the country. Opportunity still remains in Australia to continue to meet the Federal Government’s mandate for increased foreign investment to add to the housing stock. Long term strategies must now be devised to allow for the Chinese government tightening the ease of outbound capital flow, and local lenders limiting funding to control their liquidity and satisfy APRA requirements. But one thing is clear—Chinese developers are determined to succeed in Australia, and, for many generations to come. Report prepared by Michelle Ciesielski, Knight Frank Residential Research.